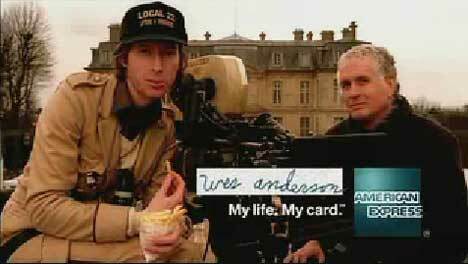 American Express recruited film director Wes Anderson to direct his own ad for American Express, part of the My Life, My Card campaign. The 2 minute TV ad begins with a character played by Jason Schwartzman inadvertently blowing up his best friend Francois. 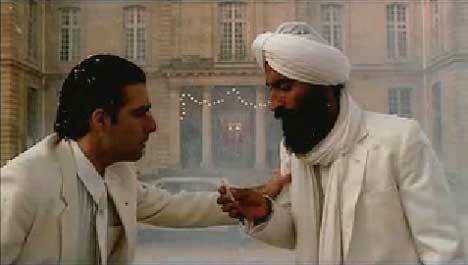 Wes Anderson cuts the filming, makes comments on the smoke, snow and lines by Schwartzman, Francois and Sikh. “It sounds fake!”. He grabs a sandwich and joins his banana-eating producer on a tour of the set. He passes the geisha, asks for a .357 pistol with a bayonet, listens to a draft dialogue, authorises a $15,000 helicopter shot (using his card), and meets Lucy, the daughter of the guy who lent the team a sports car. Finally he gets up in the film crane with his director of photography to tell us that his life is about telling stories. “My card is American Express”. The Wes Anderson spot was developed at Ogilvy & Mather, New York, by executive creative director David Apicella, group creative directors Chris Mitton, Terry Finley, art director David Lloyd, copywriter Dan Kroeger, music producer Sara Matarazzo, executive agency producer Alice Mintzer and agency producer Rachel Watson. Filming was directed and written by Wes Anderson via Moxie Pictures, with executive producers Dan Levinson, Lizzie Schwartz, Robert Fernandez, director of photography Bob Yeoman (who appears with Wes on the crane at the end). Editor was Vincent Marchand at Lost Planet Editorial and Première Heure. Theme music from Truffaut’s 1973 movie Day for Night (La Nuit Américaine) was used under the supervision of Randall Poster at Search Party Music. The American Express ad has a strong affinity with the Truffaut movie, using the theme of film director as actor, and actors doubling as film crew. Wes Anderson is known as writer and director of Bottle Rocket (1996) Rushmore (1998), The Royal Tennenbaums (2001), and The Life Aquatic with Steve Zissou (2004). The Darjeeling Limited is due out this year, while The Fantastic Mr. Fox is due for release in 2009. Anderson has also directed TV ads for Avon (Meet Mark), Dasani (Bear, Dog, Hamster, Salmon), and Ikea (Kitchen and Living Room).